Aggressive Harnett Criminal Lawyers Fighting to Prevent, Reduce or Dismiss Your Charges with powerful resources available to help our clients. This allows us to provide you with the best criminal defense, no matter what charges you are facing. NC Drivers license revoked? Harnett County DUI lawyer can help! Free consultation. Assaults can happen quickly. What was a simple disagreement quickly escalates. Something a little more menacing happens and a fist is thrown. It can go downhill from there rapidly. If you are charged with an assault crime, you will need the help of a strong criminal defense attorney to stand a chance against aggressive prosecutors. The punishments for conviction on any of these charges can be severe, and qualified legal representation is a must. You will need someone that can listen to your side of the story and give you best possible representation in these matters. Our goal is to always protect your freedom. Please contact us at (919) 331-0312 to get a free evaluation of your assault case in Harnett or Wake County. Your one chance to defend yourself must be used wisely. Any mistakes can be critical. That’s why the experienced criminal defense lawyers from White Law Firm in Angier, NC analyze every detail and use every defense to fight for your rights. We regularly represent clients in Wake County Courts and Harnett Courts in Raleigh and Lillington. Any violent act, threat of violence or abusive behavior that happens between people who live together, have a child between them, or were earlier married or dating can be considered . The charge can be filed as either a felony or a misdemeanor, and is prosecuted by a special team. Only the best defense lawyer should represent you, and a defense attorney from White Law Firm will represent you in the best possible way. Assault is an attempt to violently injure another person and may include any threat to do so. Battery is an unwanted physical act that causes harm. Cases of assault are typically misdemeanors, while battery charges can be either a misdemeanor or a felony. Either of these charges can result from any confrontation. A threat to kill or injure, even if no actual attack occurs or there is no intent of actually following up on the threat. Anyone convicted of a terrorist threat is subject to serve jail time. 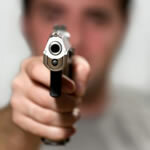 Assault with a deadly weapon occurs when an individual assaults someone with a deadly weapon. A deadly weapon can be any object that or force that is sufficient to cause serious bodily injury. Assault with a vehicle, knife, bottle, baseball bat, drinking glass or any other object or tool that can cause bodily injury may be considered assault with a deadly weapon. At White Law Offices, we have the experience you need to move past this time in your life; no matter how serious the charge. Contact us today at (919) 331-0312.